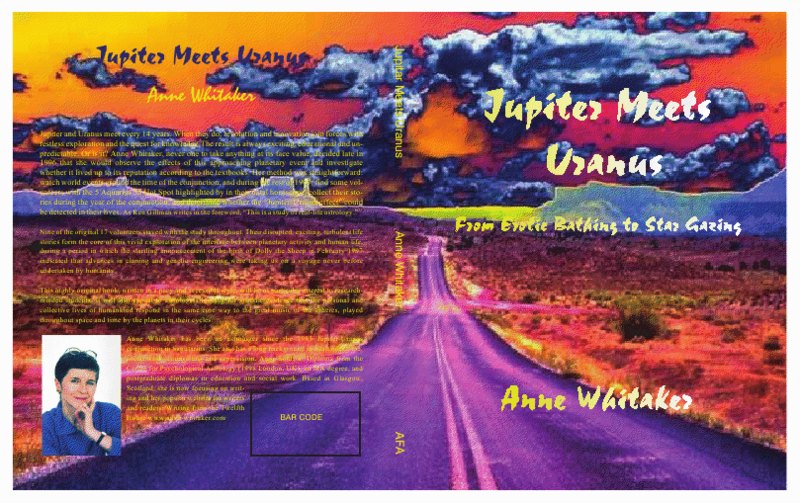 In her new book published by the American Federation of Astrologers, (April 2009) Scottish astrologer Anne Whitaker reveals the results of her extensive research project conducted during the 1997 Jupiter-Uranus conjunction in Aquarius. Her research includes mundane events and the conjunction’s effects in individual lives, as she explains in this interview, first published in May 2009 by the AFA Newsletter. Anne also offers insights into the upcoming Jupiter-Uranus conjunctions in Pisces and Aries. AFA: How often does a Jupiter-Uranus conjunction occur? AW: Every 14 years. There were eight during the 20th Century, with two in Aquarius–one on March 4, 1914 at 9 degrees, 32 minutes of Aquarius, and the other at 5 degrees, 55 minutes of Aquarius on February 16, 1997. AFA: What is its essential meaning? AW: In brief, it is a combination of energies regarded as dynamic, unusual, disruptive, expansive, unpredictable – breaking down the old order, stimulating breakthroughs to new levels of expression and understanding, individually and collectively. The Aquarian conjunction is the one most powerfully connected to radical and disruptive social, political and technological shifts, for reasons which are explored in the book. AFA: Few astrologers are doing research, and you may be the first, at least in many years, to undertake such a massive project linking both mundane and personal astrology. Why did you decide to do this research project? AW: It feels as if it decided to do me! Seriously though–I have long been fascinated by the link between micro and macro levels of existence. I began to practice as an astrologer under the Jupiter-Uranus conjunction in Sagittarius of 1983, around that time hearing my first ever lecture on mundane astrology given by the late Charles Harvey. He inspired an interest in exploring the links between individual and collective life via astrology. By I996, I was excited by the prospect of doing some original exploration of a planetary combination which had been present at the birth of my own astrological career. AW: It is a research study of the Jupiter-Uranus conjunction, set in its mythological and historical context, including a very broad tracking of the pulse beat of the conjunction through the four elements from 500 BC to 2500 AD, which identifies some interesting correlations with broad historical changes. It then narrows down to an exploration of mundane and personal life during the Aquarian conjunction of 1997-98, extending to 1999-2001 when Neptune transited the 5 Aquarius 55 Hot Spot where Jupiter and Uranus met on February 16, 1997. AFA: What mundane events occurred? AW: Lots! The major event–just 10 days after the conjunction occurred–was the announcement to the world of the existence of Dolly the Sheep, the first ever cloned animal, created by scientists based in Scotland. Over the weekend of the conjunction, February 15-16, the crew of USA’s shuttle Discovery effected repairs to the Hubble space telescope, completing five five space walks to do so. Chapter five in my book tells of many more happenings. AFA: What are some examples of monumental recorded events that have occurred during previous Jupiter-Uranus conjunctions? AW: Let’s take the theme of exploration. Explorer Ponce de Leon stepped ashore near Cape Canaveral (thus named by the Spanish some years later) on the morning of April 3, 1513, when there was an exact Jupiter-Uranus conjunction in Aries, to claim the New World later to become the United States of America. Precisely 33 Jupiter-Uranus conjunctions later, on July 20, 1969, there was an exact Jupiter-Uranus conjunction in Libra when Neil Armstrong stepped onto the Moon’s surface, the first human to do so. The spacecraft on which the astronauts traveled was launched from Cape Carnaveral. . . .
AFA: How many people did you track during the project? Who are they? How did you find them? AW: Seventeen individuals took part in the first phase of the research from February 1997 to January 1998. I had a sudden inspiration while being interviewed for a magazine in late 1995, to ask readers whose birthdays fell between January 24 and 26 of any year (when the Sun would be transiting 5-6 degrees of Aquarius) to contact me before February 1997 so that I could follow developments in their lives that year. Out of the response came three serious volunteers, to whom I added three clients and 11 of my astrology students. Six participants knew no astrology. All 17 had extraordinary years. AFA: Was the participant feedback surprising or was it what you expected? AW: I set out with as open a mind as I could muster, bearing in mind Liz Greene’s wry comment in one of her seminars: “ If you can predict it, it isn’t Uranus! ” A big surprise was the male client, “Frank” (see chapter six in my book). He depressed me by answering all the questionnaires with monosyllabic negatives, then in his summing-up provided a vivid picture of his “amazing year.” The biggest surprise was the “Jupiter-Uranus effect” showing up so clearly in all their lives. I hadn’t expected that. AFA: Were you able to validate any astrological precepts such as the influence of hard and soft aspects or orbs? AW: Yes. All participants reported disruptive, unpredictable, expansive life changes. But those with a strong natal Jupiter-Uranus signature went through more radical disruptions and breakthroughs to new levels than those whose natal Jupiter-Uranus signature was absent–or weak, i.e., minor or soft aspects, wide orbs. AFA: What differences did you observe between contacts from retrograde and direct planets? Were the stations outstanding in any way? AW: Yes. Just one example: Questionnaire 2: Summer/Autumn 1997 asked if the period of October 13-15 was significant; Uranus turned direct on 5 Aquarius then. Almost everyone reported left-field Uranian happenings. The most markedly Jupiter-Uranus person in the study, Lucia, led a deprived group of inner city youngsters through a powerfully life-changing artistic event involving the spontaneous use of her astrological knowledge, October 13-15, 1997. The book also details striking collective effects involving retrograde and direct planetary motion. AFA: Why did you continue the research beyond 1997-1998, the year that the Jupiter-Uranus conjunction was operational? AW: From April 1999 until the end of 2001, the planet Neptune transited the observational band of 4-7 degrees Aquarius which I had set as the boundary for observing the Jupiter-Uranus conjunction’s impact. I was curious to discover whether Neptune’s crossing would reactivate the “Jupiter-Uranus effect” I had demonstrated in collective and personal life in the 1997-1998 part of the research. To my great surprise, given the diffuse nature of Neptune, it did. This was an affirmation of the astrological precept that powerful planetary meetings on particular degrees of the zodiac “charge-up” those degrees thereafter with the flavor of their meeting. AFA: Were there any striking observations regarding house rulerships? AW: Yes. It was clear, for example, that the houses or angles ruled by Neptune as it traversed the observational band mentioned above, were the areas of life most up for disruptive, expansive, unpredictable changes for individuals during the stated time period. AFA: Do you see Jupiter-Uranus as positive or negative change, or does it represent something else? AW: Without the unimaginably destructive act of creation, the Big Bang, which as far as we can surmise began our universe, we would not be here to observe our world’s wonders as well as its terrors. Positive and negative energies are two sides of the same coin, wherever we look. I hope I have conveyed that unity adequately in ‘Jupiter Meets Uranus’. AFA: What can we expect in general terms from the upcoming 2010 Jupiter-Uranus conjunctions in Aries and Pisces? AW: in essence, the unexpected! And this question needs a whole article, not a few brief paragraphs. The Jupiter-Uranus conjunction in Pisces-Aries-Pisces comes into orb (10 degrees) at the end of March 2010, and separates (10 degree orb) in mid-March 2011. Fasten your seat belts! The human community and probably the natural world are in for a bumpy ride. This Jupiter-Uranus conjunction will arrive at a turbulent point: joining the last Saturn-Pluto square since its conjunction of the early 1980s, and amplifying the first Uranus-Pluto square from its conjunction which dominated the 1960s: that decade of the Vietnam war and its protesters, political assassinations, women’s liberation, musical revolution and the beginning of the micro-technology metamorphosis which has utterly changed our world in only a few decades. In common with the 1997 conjunction that linked in an astonishing bowl shape with Mars, Saturn and Pluto (Jupiter Meets Uranus, p. 40), this will be no “ordinary” Jupiter-Uranus event: Jupiter conjunct Uranus at 0 Aries will form a T-cross with Saturn at 28 Virgo and Pluto at 4 Capricorn. Mars at 1 Virgo will trine Pluto, opposes Neptune and link back to quincunx the Aries Jupiter-Uranus conjunction. The Jupiter-Uranus predilection for seeing no limits, leaping before it looks and challenging the established order expressed through the filter of the rash, angry impetuousness of Aries and locked with the harsh, power-driven determination not to budge of the Saturn-Pluto square, offers a difficult and dangerous picture in the realm of international politics, for instance. Misuse of technology by angry, militant fanatics convinced they have God on their side and that the old order must be overturned, is a picture which arises from this. We can also await more disruption and turbulence on the economic front, but I leave further speculation on this issue to those much better qualified to comment than I! Religion is not going to diminish in impact; the Piscean backdrop to much of the conjunction will see to that. We may well see an inspirational “messiah”-type figure emerge with challenging and disruptive effect socially and politically in the Aries phase. Also suggested is fiery eruption disrupting the very fabric of the Earth itself. On a more positive note, the urgency of the accelerating environmental crisis may give birth to great leaps forward in the pioneering of new technologies, e.g., for harnessing solar power and reducing environmental damage. The challenging pattern I have described, set against the cardinal backdrop of the natural zodiac (which I used for most of the Jupiter Uranus conjunction charts in the book) also links in with the Super Galactic Centre, currently at around 0 degrees Libra. A picture arises from this of major scientific breakthroughs in our understanding of the Universe or Multiverse, of which our tiny solar system is a mere blip of ephemeral matter. Perhaps the CERN Large Hadron Collider will work this time, and we’ll find the Higgs Boson particle at last . . . or maybe it really will blow us all to bits! There is a most interesting article bringing the CERN particle accelerator and the Super Galactic Centre together, at http://cerncourier.com/cws/article/cern/29853. Check it out! AFA: Do you have a particular area of interest where you expect the 2010 conjunction to deliver, as it were? AW: One of my own special interests is in genetics and cloning. The 1969 conjunction in Libra saw a Harvard medical school team identify the first gene (see p. 93 of Jupiter Meets Uranus). The year after the 1983 conjunction in Sagittarius, a British scientist developed genetic fingerprinting (p. 93). In 1997 with the Aquarian conjunction, we had the announcement of the first cloned animal, Dolly (p. 43). The conjunction in Aries in 2010 suggests the next stage, which could well be human cloning, currently illegal where the creation of a complete human is concerned. Maybe a defiant, pioneering male doctor/scientist is prepared to pit himself against the established order and rule of law to do so? There are “maverick doctor” rumblings in the press about this already. . . .
AFA: Do you have a special wish for the human community for something uniquely helpful which could emerge from this powerful and disruptive energy field? AW: Yes. I would love to see science fiction fantasies over many decades become fact with the arrival on Planet Earth of small but fabulously evolved purple people from Planet Zog to teach us how to mend our ways. Now THAT would be unexpected!! AFA: As an astrologer, what did you learn from the project? AW: I began to study astrology more than 25 years ago as part of my quest to try and prove to myself that we do not live in a random, meaningless universe. Time and again, on the large and small scale, astrology has offered that proof, enriching my life and I hope in some measure, the lives of my clients and students along the way. This research has affirmed very powerfully that the personal and collective lives of humankind respond in the same core way to the great music of the spheres, played throughout space and time by the planets in their cycles. AFA: Finally, a question on YOUR horoscope. Is Jupiter-Uranus prominent? AW: Well, how did you guess?! My chart is an eastern bowl shape, with Uranus leading from the tenth house, bi-quintile Jupiter which closes the bowl from the third house. My Ascendant, on the Jupiter-Uranus midpoint, was squared by transiting Pluto during the whole research period. . . . Tagged 1997 Jupiter-Uranus conjunction in Aquarius., AFA Newsletter, American Federation of Astrologers, Anne Whitaker, Big Bang, Cape Canaveral, CERN Large Hadron Collider, Dolly the Sheep, Hubble space telescope, Jupiter/Uranus conjunction 2010/11, Jupiter/Uranus conjunctions, Moon Landing July 20 1969, upcoming Jupiter-Uranus conjunctions in Pisces and Aries.